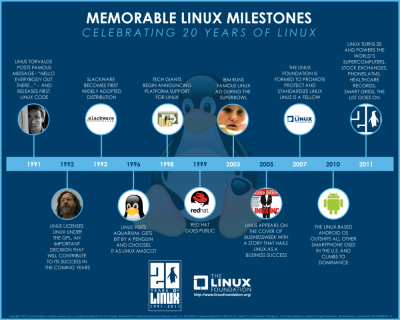 The Linux Foundation is celebrating 20 years of Linux. Ever since Linus Torvalds posted his famous message ‘Hello everybody out there…”, Linux has come a long way! And how did the Penguin get associated with Linux? It was in 1996 that Linus was bitten by a Penguin when he visited an acquarium. Thats when he decided to chose a Penguin as a Linux mascot. Click on the above image from LinuxFoundation.org to enlarge it. Also check out this video from the Linux Foundation. The Linux Foundation has organized several activities at LinuxCon North America 2011, including a Gala will be held on August 17-19, 2011 in Vancouver, Canada.